We all know that Sales & Marketing Director Clive Siddall enjoys his outdoor pursuits – marathon man Clive is also a keen open water swimmer – but less well known is his 15 year involvement as a volunteer with Calder Valley Search & Rescue Team. It’s a serious business – Clive also acts as Treasurer for the organisation – and this year’s snow and ice saw the volunteers respond to twice as many emergency calls over a two month period than in any previous year. However, earlier this month they were involved in a more unusual operation – taking someone deep into the heart of our wild Pennine moorland rather than rescuing them from it! 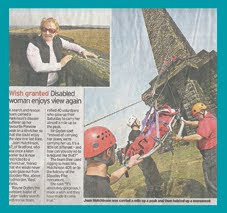 The team were delighted to help Parkinson’s disease sufferer Joan Hutchinson achieve a heartfelt ambition to revisit Stoodley Pike. Once a keen walker and now confined to a wheelchair, Joan had dreamed of experiencing the stunning views from this landmark again. 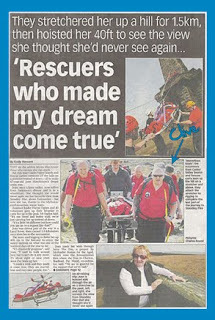 Clive was part of a team of 40 that made Joan’s wish come true, driving as close as possible to the Pike in a Land Rover then stretchering Joan over a mile to the viewpoint – even using rescue techniques and equipment to raise her to the viewing platform 40 feet above the ground. She can also be seen sitting on a Doherty transit chair kindly donated to the Rescue team by Sidhil.